- "...Naming a Jigglypuff after you"
Grace is super insightful you guys. And we're back! Well, I was never really gone. There just wasn't a Monday story comic because I was setting up a new work compy (not a dinosaur) due to growing concerns that my old compy (also not a dinosaur) was less reliable than I was comfortable with given how much I rely on having good compy (I really wish I was talking about a dinosaur) for work. This is pretty consistent George behavior at this point, though I admit we haven't seen a lot of examples of it. George totally knows stuff is up, though. How much does he know? Not clear. How much does he think he knows compared to what he really knows? Also not clear. A can of soda? Again, not clear. Maybe if it was a bottle, but a can? No dice. 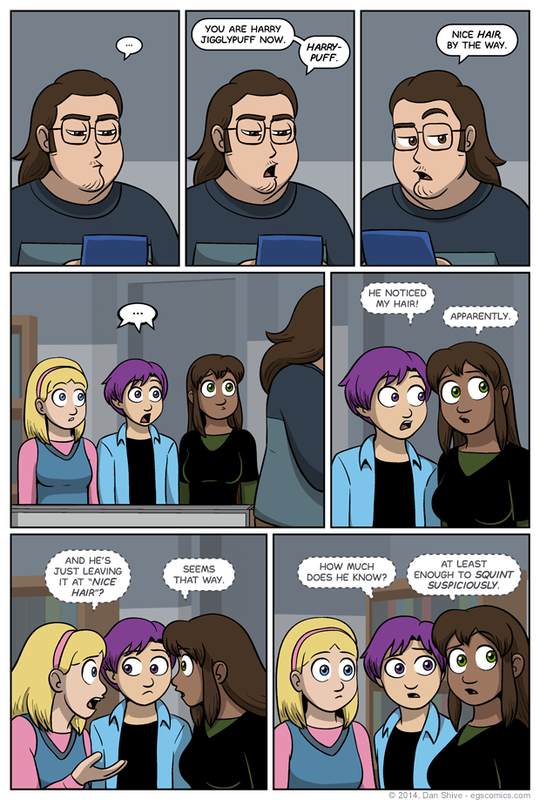 Monday EGS:NP - You know, as opposed to the non-existent Tuesday EGS:NP. Monday Sketchbook - I hope you like Deep Space Nine! Tuesday Sketchbook - Includes gratuitous V5-styleness and possibly not the most covering of outfits, just so you know.